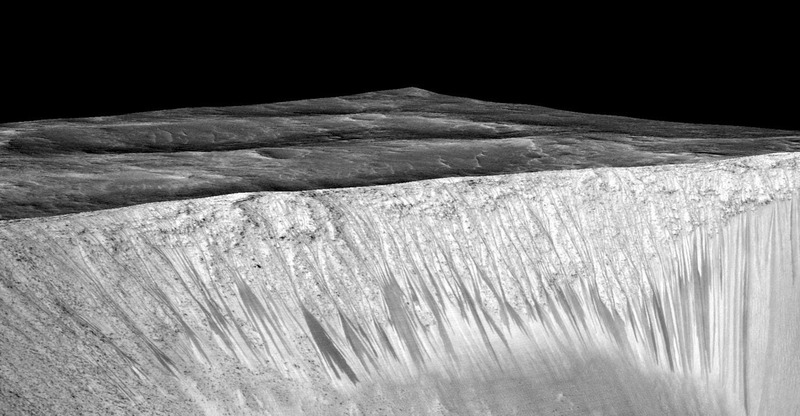 The dark, narrow, 100 meter-long streaks shown above called recurring slope lineae flowing downhill on Mars are inferred to have been formed by contemporary flowing water. Recently, planetary scientists detected hydrated salts on these slopes at Hale crater, corroborating their original hypothesis that the streaks are indeed formed by liquid water. The blue color seen upslope of the dark streaks are thought not to be related to their formation, but instead are from the presence of the mineral pyroxene. New findings from NASA's Mars Reconnaissance Orbiter (MRO) provide the strongest evidence yet that liquid water flows intermittently on present-day Mars. Using an imaging spectrometer on MRO, researchers detected signatures of hydrated minerals on slopes where mysterious streaks are seen on the Red Planet. These darkish streaks appear to ebb and flow over time. They darken and appear to flow down steep slopes during warm seasons, and then fade in cooler seasons. They appear in several locations on Mars when temperatures are above minus 10 degrees Fahrenheit (minus 23 Celsius), and disappear at colder times. Dark narrow streaks called recurring slope lineae emanating out of the walls of Garni crater on Mars. The dark streaks here are up to few hundred meters in length. They are hypothesized to be formed by flow of briny liquid water on Mars. The image above was produced by draping an orthorectified (RED) image (ESP_031059_1685) on a Digital Terrain Model (DTM) of the same site produced by High Resolution Imaging Science Experiment (University of Arizona). Vertical exaggeration is 1.5. Ojha first noticed these puzzling features as a University of Arizona undergraduate student in 2010, using images from the MRO's High Resolution Imaging Science Experiment (HiRISE). HiRISE observations now have documented RSL at dozens of sites on Mars. The new study pairs HiRISE observations with mineral mapping by MRO’s Compact Reconnaissance Imaging Spectrometer for Mars (CRISM). The spectrometer observations show signatures of hydrated salts at multiple RSL locations, but only when the dark features were relatively wide. When the researchers looked at the same locations and RSL weren't as extensive, they detected no hydrated salt. Perchlorates have previously been seen on Mars. NASA's Phoenix lander and Curiosity rover both found them in the planet's soil, and some scientists believe that the Viking missions in the 1970s measured signatures of these salts. However, this study of RSL detected perchlorates, now in hydrated form, in different areas than those explored by the landers. This also is the first time perchlorates have been identified from orbit. "The ability of MRO to observe for multiple Mars years with a payload able to see the fine detail of these features has enabled findings such as these: first identifying the puzzling seasonal streaks and now making a big step towards explaining what they are," said Rich Zurek, MRO project scientist at NASA's Jet Propulsion Laboratory (JPL) in Pasadena, California. For Ojha, the new findings are more proof that the mysterious lines he first saw darkening Martian slopes five years ago are, indeed, present-day water. 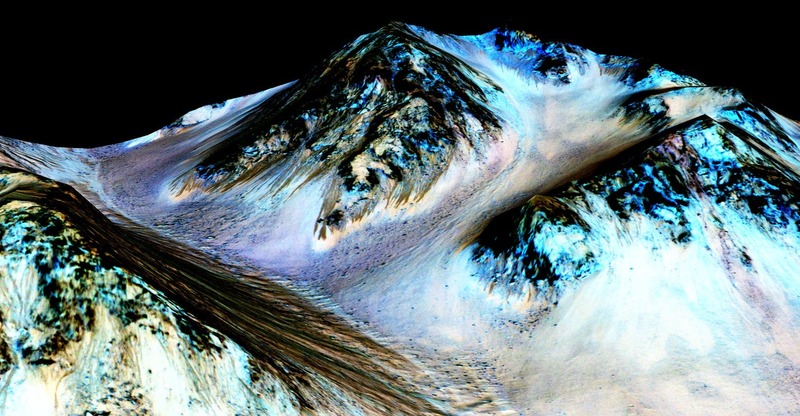 "When most people talk about water on Mars, they're usually talking about ancient water or frozen water," he said. "Now we know there’s more to the story. This is the first spectral detection that unambiguously supports our liquid water-formation hypotheses for RSL."